I have straightened my hair few weeks ago and I want to share my process. I have not mastered that technique 100% yet because for the past 3 years I have only straightened my hair 3 times. But I am learning by trial and errors. I straightened my hair in several steps to minimize damages that heat can cause on my hair. 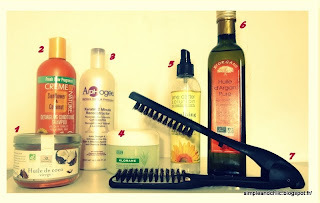 4/I used a mask (4) under a heat cap for 20/30 minutes to moisturize and condition my hair. This mask also claims to help the hair straitening process. One of my favorite mask is from this brand that’s why I wanted to try this one. It was my first use and I have to say that I was not disappointed; it's a good one. The use of heat can be very damaging on the hair; that’s why I do not want to rely solely on ONE heat protectant. This time my only heat protectant was the entire process before I used my blow-dryer (oil treatment, protein conditioner, conditioning mask). After I rinsed out the mask I added some home-made leave-in (5) product; I air-dried my hair and when it was 80 % dry I lightly blew-dry (9) my damped roots with my wide tooth comb. I had planned on using the “Denman brush” (7) for the first time to help me straightening my hair but I did not use it in the end as it was slowing me down. I think I need some training with it. I have a really good flat ironed (10) so I used it taking a small amount of hair each time. The heat was at °F380; it might seem a lot but that is what my hair needs. In the end I decided to “try” adding some curls with the flat ironed. After taking the pictures I decided to cut a few inches off my hair. I almost forgot, while my hair is straight I lightly moisturized the ends regulary with a small amount of Argan oil (6). Next time I straighten my hair I’ll make an update. Most products mentioned are easy to find with the Internet. This mask is from a French brand so you can easily find it in French Pharmacies, otherwise it might be more difficult to find. Below is a link for international orders, but you can also try threw ebay. 10 Flat iron (E-038) by Wetline with Ceramic plates and Ionic heat.